Universal health coverage (UHC) is central to health development in the post-2015 era, as it is the key platform for the achievement of health equity. UHC is an integral element of Sustainable Development Goal (SDG) 3, as Target 3.8, which includes ensuring that all people have “access to quality essential health services and safe, effective, quality and affordable essential medicines and vaccines” without suffering from financial hardship. There are two explicit indicators for global monitoring of the progress of UHC. Indicator 3.8.1 measures “coverage of essential health services (defined as the average coverage of essential services based on tracer interventions that include reproductive, maternal, newborn and child health; infectious diseases; non-communicable diseases; and service capacity and access, among the general and the most disadvantaged population)”; and Indicator 3.8.2 measures the “proportion of people with large household expenditures on health as a share of total household expenditure or income”. Also relevant to UHC monitoring is SDG Target 3.b, which promotes access to medicines and vaccines in low- and middle-income countries (LMICs). For this target, Indicator 3.b.1 is for monitoring the proportion of people with access to affordable vaccines, while the proportion of health facilities having a “core set of relevant essential medicine available and affordable on a sustainable basis” is monitored by Indicator 3.b.3. Without significant and sustained commitments by governments, many low- and middle-income countries, are unlikely to be able to achieve UHC by 2030, given their current limited fiscal space for health. Data from the World Health Organization (WHO) show that in 2016 the share of general government health expenditure as a percentage of general government expenditure for low-, lower-middle-, upper-middle- and high-income countries was 6.8%, 8.3%, 12.2%, and 14.9%, respectively, showing significant differences across country income levels. Tracking UHC progress is a key function that can hold governments and partners accountable for their UHC commitments. A monitoring and evaluation (M&E) mechanism is crucial to guide countries along their paths towards UHC. WHO and the World Bank jointly published the 2017 Global monitoring report for tracking UHC progress where Indicators 3.8.1 and 3.8.2 are measured. For the first time, tracking of Indicator 3.8.1 was reported, using a new, single “UHC coverage index” derived from a series of tracer indicators. Sixteen tracer indicators were selected for the index, which included four from within each of the categories of reproductive, maternal, newborn and child health; infectious diseases; noncommunicable diseases; and service capacity and access. The UHC coverage index is a composite index that ranges from zero to 100, with a higher index indicating better access. In addition to the report, three publications in Lancet Global Health also reported the details of development of the index and the global baseline data for 2015, together with estimates of recent trends that are relevant to financial protection., These global monitoring tools help countries to develop their own comparable framework, but the key responsibility lies with individual countries to improve institutional capacities and track their own progress, taking into account the national and subnational priorities. Thailand had rolled out the Universal Coverage Scheme (also known as the 30-Baht Scheme) nationally by 2002, under the National Health Security Act, and currently has nearly 100% of the population covered under the programme – well before the SDG 3.8 commitment at the United Nations General Assembly in September 2015., As a UHC pathfinder among LMIC countries, Thailand puts UHC at the top of government, foreign affairs and health agendas, where the M&E platform has been gradually strengthened. This paper outlines the key M&E tools that Thailand uses to track UHC progress with greater detail beyond the SDG Indicators 3.8.1 and 3.8.2, and it discusses strengths and limitations of and key enabling factors for the tools. The lessons from Thailand may help other countries in strengthening their M&E platforms for UHC. Thailand monitors three dimensions of its UHC progress, namely population coverage, service coverage and financial risk protection, and expands each of these in more detail. The main data sources are national surveys; health facility and administrative data; specific disease registries; and research conducted by different organizations across the public sector. The National Health Security Office (NHSO) monitors population coverage for all public health insurance schemes on a regular basis, through the use of civil registration and vital statistics (CRVS). The CRVS mandates birth and death registration of the whole population, through 15-day and 24-hour mandatory notification of such events to local civil registries. According to the Survey of Population Changes 2005–2006, registration of births and deaths was 96.7% and 95.2% complete, respectively, at that time. All citizens are given a unique citizen ID (CID) at birth, which is a key reference for all legal or official transactions, such as education enrolment, health entitlement, opening a bank account and holding a driving licence. Every 2 weeks, the Bureau of Registration Administration of the Ministry of Interior shares the total number of births and deaths, including their CIDs, with the NHSO, allowing a real-time update of population coverage. In 2017, 99.95% of Thai people who were residing in Thailand were covered. In addition to CRVS, population coverage is also monitored by the Health and Welfare Survey (HWS) – a nationally representative household survey, conducted biennially by the National Statistical Office (NSO). The survey asks whether respondents have any public or private health insurance. The latest survey in 2017 showed that 99.2% were insured. The benefits of this additional monitoring through survey are to confirm the CRVS data and also to ensure that people are aware of their insurance entitlements. The HWS provides more details than CRVS, such as the demographic, socioeconomic and wealth profiles of beneficiaries across three public health insurance schemes. It also links with service utilization and out-of-pocket payment. These independent parameters, which are not available from CRVS, facilitate equity assessment. The HWS is responsive to country policy needs, as it can integrate additional modules of national interest, such as unmet health-care needs, citizens’ knowledge about antibiotics, and awareness of antimicrobial resistance. Box 1 describes the strengthening of HWS as a key M&E platform at household level. This section describes national data sources that support the monitoring of service coverage as required by SDG Indicator 3.8.1. Thailand uses surveys, health facility and administrative data, and disease registries to track the 16 tracer indicators in the four categories of reproductive, maternal, newborn and child health; infectious diseases; noncommunicable diseases; and service capacity and access. First, reproductive, maternal, newborn and child health services are monitored through multiple indicator cluster surveys (MICS). The NSO has conducted these surveys in collaboration with the United Nations Children’s Fund, as part of the global MICS programme, initially to track progress of the Millennium Development Goals, and subsequently to continue monitoring the SDGs and other health indicators. The NSO has taken full financial and technical responsibility for MICS. Second, for monitoring infectious diseases, specific disease registries are available for patients with tuberculosis (TB) and HIV. Individual data on access to TB drugs or antiretroviral therapy (ART) and their treatment outcomes are entered to the electronic registry by facilities in real time. The registries facilitate continuity in medication by all facilities, as their records are accessed by authorized staff in hospitals throughout the country. By comparing with the estimated incidence of TB or people living with HIV, treatment coverage and effective treatment coverage can be calculated. The TB registry in Thailand reports to the Bureau of Tuberculosis, Ministry of Public Health (MOPH), and the ART registry reports to the NHSO. In Thailand, malaria is only problematic in provinces bordering Myanmar, Cambodia and Malaysia, with confirmed cases below 20 000 in 2016. Hence, there is no routine malaria survey. A survey on people at risk who sleep under insecticide-treated bednets is conducted periodically by the Bureau of Vector-Borne Diseases, Department of Disease Control, MOPH. The survey in 2015 showed the coverage of insecticide-treated bednets was 38.5% among the population at risk. For water and sanitation services, the basic sanitation accessed by households is monitored by MICS. Third, the proxy indicators for noncommunicable diseases are monitored by NSO’s household surveys and facility data. The National Health Examination Survey (NHES) is managed by the Health Systems Research Institute, in collaboration with the MOPH, Thai Health Promotion Foundation and many universities, primarily to estimate the prevalence and trends of selected noncommunicable diseases (cardiovascular disease, diabetes, hyperlipidaemia, hypertension, stroke) and their risk factors. Despite its utility, the NHES is not conducted frequently; the first one was conducted in 1991–1992, with subsequent surveys in 1996–1997, 2003–2004, 2008–2009 and 2014. For tobacco control, a survey on cigarette smoking behaviour started in 1976 and has been conducted every 3 years since then, by the NSO. For cervical cancer screening, coverage in the targeted population is monitored by the MOPH and NHSO using routine administrative data. Fourth, for service capacity and access, the numbers of hospital beds and health professionals per capita are reported by the Strategy and Planning Division of the MOPH, using administrative data. However, Thailand does not conduct surveys on access to essential medicines at its public and private facilities. The National list of essential medicines, covering over 700 active pharmaceutical ingredients and 74 herbal medicines, is the basic pharmaceutical benefit package for all Thai citizens. In the Thai district health-care delivery system, the MOPH’s district hospitals also perform drug procurement and oversee stock management for health centres within their district health system network, to ensure the availability and quality of essential medicines. The general monitoring mechanism, operated through periodic site visits and a consumers’ hotline, has not indicated any problems with drug adequacy at primary care level. Lastly, the International Health Regulations (IHR) core capacity index was assessed by the first joint external evaluation in 2017. The immunization coverage of essential vaccines in the national programme is monitored by the MOPH, using health facility data and, less frequently, immunization surveys using the 30-cluster technique. 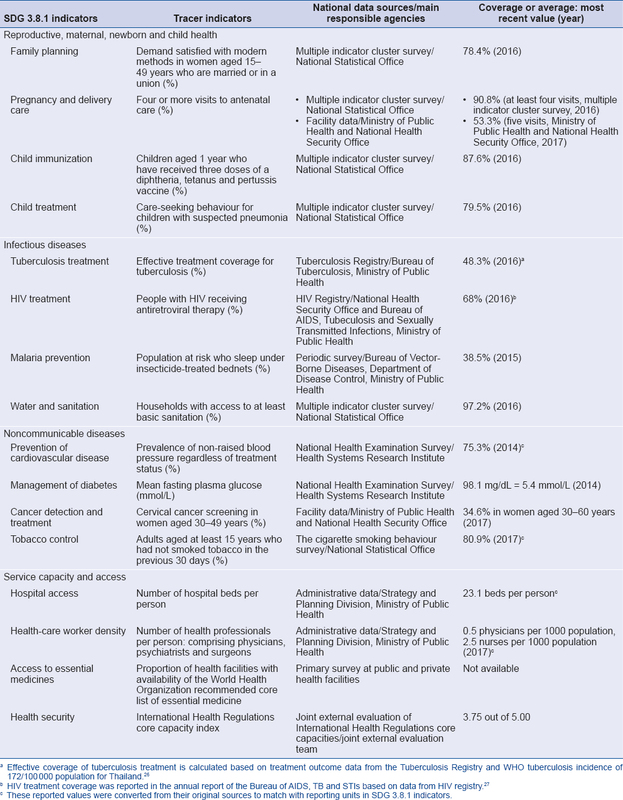 [Table 1] describes the data sources that Thailand uses to monitor the 16 essential services defined in SDG 3.8.1. Beyond the SDG requirement of Indicator 3.8.1, Thailand’s mature M&E system also provides comprehensive evidence on service utilization, unmet health-care need and other services, in accordance with national policy priorities. The overall utilization rates are monitored using two channels: a routine administrative data set generated from health facilities; and the HWS. The numbers of outpatient visits and hospital admissions are recorded and the utilization rates per person per year are calculated. For the Universal Coverage Scheme, which is the largest public insurance scheme covering 73% of the population, the annual utilization rates have shown an upward trend, from 2.416 to 3.821 visits per capita for outpatient visits and 0.100 to 0.125 admissions per capita for inpatient services between 2006 and 2017. This clearly shows improved access after introduction of UHC. The HWS also provides information on the use of insurance entitlement, for outpatient, inpatient, health promotion and dental services, including the reasons for those who decided not to use their entitlement and opted to pay for service elsewhere. In 2017, the data showed that the proportion of insured patients who used their insurance entitlement was 63.1%, 92.2%, 88.4% and 66.3% for outpatient, inpatient, health promotion and dental services, respectively. The top three reasons for not using health insurance entitlement were having minor illness, the long queue and the inconvenience of seeking health care during office hours. The HWS also monitors unmet health need. Since implementing UHC policy does not always mean all barriers to health service are removed, a module to assess unmet health need, adapted from the European Union Statistics on Income and Living Conditions survey, was incorporated as a module of the HWS in 2015., Unmet health needs and reasons for forgoing health care are monitored separately for outpatient, inpatient and dental services. The latest data from the 2015 HWS showed that unmet health need was 1.50% for outpatient, 0.14% for inpatient and 0.99% for dental services. The prevalence of unmet needs for outpatient and dental services is on a par with that of countries in the Organisation for Economic Co-operation and Development. The factors significantly associated with unmet health needs were age, entitlement to health insurance, economic status and residential area. The main reasons mentioned were not having time to seek care, the long queue and inconvenient transportation. Monitoring unmet health-care need is critical to verify whether the low prevalence of catastrophic health expenditure among the poorest quintiles is the result of forgoing necessary health care, which can result in disability or mortality. A high level of unmet need can explain a low level of out-of-pocket payment, as poor households forego treatment. Through the MOPH and NHSO, Thailand monitors several indicators of service coverage for a wide range of services, using facility data. This covers proxy indicators for disease prevention and health promotion, curative care and rehabilitation service, for example influenza vaccine for elderly individuals; diabetes and hypertension screening; percutaneous coronary intervention; cataract surgery; renal replacement therapy; and rehabilitation care for people with disabilities and bedridden patients., Access to high-cost medicines, orphan drugs, antidotes and antivenoms is also monitored annually by the NHSO., Some of the proxy indicators are subject to adjustment, based on the country’s priorities and policy agenda for specific periods. Furthermore, a few specific disease registries have been established for various purposes, for example case management, monitoring treatment outcomes and financial reimbursement. These registries, such as those for renal replacement therapy and ART, benefit the monitoring of service coverage and treatment outcomes. The SDG target indicator 3.8.2 measures financial risk protection in terms of the proportion of the population suffering catastrophic expenditures on health. Two thresholds are used: spending greater than 10% and greater than 25% of total household expenditure or income on health. The 2017 Global monitoring report also presented additional data on catastrophic spending defined as 40% of non-food consumption. Thailand monitors the incidence of both catastrophic health spending and medical impoverishment, using data from the socioeconomic survey (SES), and provides prevalence at national and regional levels. The SES is another nationally representative household survey conducted routinely by the NSO. It was conducted 5-yearly when it was first introduced in 1957, then biennially from 1987, and it has become annual since 2006 as a result of the cabinet’s decision for more timely monitoring. Samples of all households are divided into 12 equal portions for monthly survey throughout the year, to minimize seasonal variation of both income and expenditure. Data on household spending are surveyed every year, whereas a module to assess household income is added every alternate year. These data show households’ monthly spending profile for both subsistence and non-subsistence categories. There are questions in the survey about spending on self-prescribed medicines and outpatient visits during the past month and spending on inpatient care during the past 12 months. The 2017 SES reported an average monthly health expenditure of 332 baht per household (self-prescribed medicines 108 baht, outpatient services 151 baht and inpatient services 73 baht), equivalent to 1.6% of total monthly expenditure, far below the 10% threshold for catastrophic health spending. Monthly health expenditures paid by households, recorded by the SES, are used to estimate the incidence of catastrophic health expenditure, using a threshold of 10% of total consumption expenditure. Overall, the percentage of households experiencing catastrophic health expenditure has gradually reduced, from 7.07% in 1990 to 2.06% in 2016. This low incidence has been enabled by a continued reduction of out-of-pocket expenditure as a percentage of current health expenditure, from more than 30% before 2000 to 12% in 2015. The reduction in out-of-pocket health payment is a result of expansion of benefit packages by public health insurance schemes. The incidence of medical impoverishment is also estimated from the SES data against the national poverty line published by the National Economic and Social Development Board. The national and regional poverty lines specific to five geographical regions are calculated separately for rural and urban areas, based on the subsistence level of food and non-food consumption, adjusted by other economic factors. The difference in the numbers of households below the poverty line before and after health payment is the number of households that are pushed into poverty, as a result of out-of-pocket payment for health. Based on these data sets, the proportion of households experiencing impoverishment from health expenditure can be estimated. The national figure for health impoverishment has reduced from 2.34% in 1990 to 0.30% in 2016. Data at subnational level are also available for provincial policy utilities. Thailand produces data on the incidence of catastrophic health expenditure and health impoverishment by socioeconomic stratifications such as geographical regions, urban/rural domiciles and wealth quintiles. This facilitates specific policy interventions to improve financial risk protection for the groups most affected. The equity of health system financing and service use is also monitored through research using financial incidence analysis and benefit incidence analysis. Two series of analyses have been conducted, for the assessment periods of 2003–2009 and 2007–2017., Financial incidence analysis considers who in the rich or poor quintiles pays for health care and how equitable the contributions are in relation to their socioeconomic status. It is assessed using the data sources from the SES and the National Health Account. Benefit incidence analysis examines the distribution of benefits from using health services that are subsidized by the government. Benefit incidence analysis uses outpatient and inpatient utilization rates of public health service from the HWS multiplied by the unit costs of outpatient and inpatient services from the NHSO’s estimates, then subtracts the out-of-pocket health payment by households. Although health equity analyses have previously been monitored on a research basis, the NHSO, which manages the Universal Coverage Scheme, has seen them as a positive development, and requested the International Health Policy Program to conduct health equity analyses as part of its routine monitoring, and to work with the NSO to maintain the contributions of the SES and HWS. Thailand uses four key tools to track UHC, namely (i) national surveys; (ii) administrative and facility data; (iii) specific disease registries; and (iv) research. These tools have different benefits and drawbacks, which should be considered in the design of appropriate national M&E platforms. The strength of using national surveys to monitor service coverage is the availability of the country’s demographic profile and socioeconomic stratification, which can inform policy decisions to improve access in specific populations and promote equity. However, the downside of these surveys is their limited ability to explore access to services for specific clinical conditions. Provided that sufficient infrastructure is available, administrative/facility data are a more appropriate platform for following up coverage of specific services. On the other hand, the downside of facility data is the lack of socioeconomic profiles. The NHES has comparative advantage in measuring biomarkers, but it is very costly and cannot be conducted frequently. The key benefit of specific disease registries is that they can serve well in M&E, with comprehensive and specific details as appropriate for particular diseases or conditions, such as continued treatment for the mobile population. However, if these registries overlap with existing routine reporting systems, the overall information system becomes fragmented, which hampers data analysis and puts heavy burdens on front-line health workers who collect data. Hence, harmonization between routine reports and registries is required. Monitoring through research can be useful for introducing an innovative method that can provide a high level of detail. Compared with facility data and national surveys, it requires fewer resources. However, research provides limited long-term monitoring and comparability across time, owing to changes in methodology, scope or definition and changing focus on certain aspects of health care. Some specific methods may require high technical skills and be difficult to institutionalize. There are several enabling factors that make the M&E systems in Thailand feasible. Well-developed infrastructure in both the health and non-health sectors is the fundamental cornerstone for health development and UHC tracking. Building on supportive infrastructure, leadership and responsibility, good collaboration among stakeholders, and institutional capacities play important roles in functioning M&E systems. First, the existence of a CRVS system with national identity mandated by the Ministry of Interior facilitates various kinds of individual data tracking. For health, the CID is linked to entitlement to public health insurance, and it is required in all transactions of service utilization. Another advantage is that the CID can be used as a reference across databases. Second, patient clinical data are comprehensively recorded, owing to the full coverage of basic technology, including computers, universal internet access, and hospital software in all hospitals and health centres. The process for data entry is either made compulsory or promoted by the MOPH, as a national regulating body, as well as agencies managing public health insurance schemes, using various incentives such as quality indicators and conditions for fund reimbursement. Third, there are a number of organizations with interests in the country’s health situation and other related determinants, notably the NSO, NHSO, MOPH and research institutes. In particular, the NSO is a key responsible organization for collecting household-level information through national representative surveys relating to several dimensions of development. On top of that, good collaboration between these organizations synergistically strengthens the power of knowledge and information by improving the utilization of data to meet policy demands. Finally, the establishment and function of the M&E platforms require certain capacities and skills. For instance, collecting data through facilities and disease registries needs technical capacities in health information and IT systems, to design and maintain the programmes. To conduct surveys, especially at national level, staff to collect data in the field must be well trained. Undertaking research may require more advanced skills in specific areas. These capacities should be developed in the country. At first, this may need support from international partners and external experts but, in the long run, domestic capacities must be sustained and should not rely solely on external consultants. It is worth noting that all of these enabling factors discussed were not purposively established to monitor the SDGs according to the global agenda, but had been developed long before the SDGs as routine monitoring for internal use at facility, subnational and national levels. Although Thailand has a M&E mechanism to monitor most indicators in SDG 3.8, some limitations should be highlighted. Most, if not all, monitoring tools only capture data on Thai citizens, especially when health information links with individual CIDs. In Thailand, there are quite a number of migrant workers and stateless persons, for whom the registration system is not very effective. As a result, information on non-Thai citizens is often lacking. Monitoring of UHC in these populations is, however, important for both public health security, such as spread of tuberculosis and neglected tropical diseases, and humanitarian reasons. Another point is that not all collected information is fully analysed and utilized for improving health system performance, which means that the current health information system is not at the most efficient stage. The country should either maximize the use of available information or reduce collection of unnecessary data. UHC is a top priority of Thailand’s government and health agenda. The country has gradually developed the tools required to monitor its health development. Despite initially being developed to track progress for national priorities, these tools are able to monitor most of the global UHC indicators. There are four key data sources: surveys; administrative and facility data; specific disease registries; and research. Each source has benefits and drawbacks that should be taken into account. Key enabling factors of Thai monitoring systems are a supportive infrastructure and information system; a policy requirement for routine records of patient data; ownership and commitment of the key responsible organizations; multisectoral collaboration; and sustainable in-country capacities. Some areas for improvement are monitoring in the non-Thai population; tracking access to essential medicines; and maximizing the use of collected data. Lessons learnt from the Thai experience could be useful for other LMICs in developing their UHC monitoring platforms. Acknowledgements: We acknowledge the National Statistical Office, Ministry of Public Health, National Health Security Office, universities, research institutions and partners for their leadership and contributions to the universal health coverage and health monitoring system in Thailand. Authorship: WW, AK and VT designed the work. All authors contributed to the writing. WW combined and presented the draft for all authors to comment and then revised and finalized the work. All authors approved the final draft. Global indicator framework for the Sustainable Development Goals and targets of the 2030 Agenda for Sustainable Development. New York: United Nations; 2018 (A/RES/71/313; E/CN.3/2018/2; https://unstats.un.org/sdgs/indicators/Global%20Indicator%20Framework%20after%20refinement_Eng.pdf, accessed 9 January 2019). Ottersen T, Elovainio R, Evans DB, McCoy D, Mcintyre D, Meheus F et al. Towards a coherent global framework for health financing: recommendations and recent developments. Health Econ Policy Law. 2017;12:285–96. doi:10.1017/S1744133116000505. Xu K, Soucat A, Kutzin J, Brindley C, Maele NV, Touré H et al. Public spending on health: a closer look at global trends. Geneva: World Health Organization; 2018. (WHO/HIS/HGF/HF Worknig Paper/18.3; https://apps.who.int/iris/bitstream/handle/10665/276728/WHO-HIS-HGF-HF-WorkingPaper-18.3-eng.pdf, accessed 19 February 2019). Tracking universal health coverage: 2017 global monitoring report. Geneva: World Health Organization and International Bank for Reconstruction and Development/The World Bank; 2017 (https://bit.ly/2rvMYyE, accessed 9 January 2019). Hogan DR, Stevens GA, Hosseinpoor AR, Boerma T. Monitoring universal health coverage within the Sustainable Development Goals: development and baseline data for an index of essential health services. Lancet Glob Health. 2018;6(2):e152–e168. doi:10.1016/S2214-109X(17)30472-2. Wagstaff A, Flores G, Hsu J, Smitz M-F, Chepynoga K, Buisman LR et al. Progress on catastrophic health spending in 133 countries: a retrospective observational study. Lancet Glob Health. 2018;6(2):e169–e179. doi:10.1016/S2214-109X(17)30429-1. Wagstaff A, Flores G, Smitz M-F, Hsu J, Chepynoga K, Eozenou P. Progress on impoverishing health spending in 122 countries: a retrospective observational study. Lancet Glob Health. 2018;6(2):e180–e192. doi:10.1016/S2214-109X(17)30486-2. Transforming our world: the 2030 Agenda for Sustainable Development. New York: United Nations; 2015 (A/RES/70/1; https://sustainabledevelopment.un.org/content/documents/21252030%20Agenda%20for%20Sustainable%20Development%20web.pdf, accessed 9 January 2019). Tangcharoensathien V, Witthayapipopsakul W, Panichkriangkrai W, Patcharanarumol W, Mills A. Health systems development in Thailand: a solid platform for successful implementation of universal health coverage. Lancet. 2018;391(10126):1205–23. doi:10.1016/S0140-6736(18)30198-3. Executive summary. The Survey of Population Changes 2005–2006 [in Thai]. Bangkok: National Statistical Office; 2006. (http://service.nso.go.th/nso/nsopublish/service/survey/popchange48-49.pdf, accessed 9 January 2019). Thai Health Information Standards Development Center Health Systems Research Institute. Review of national civil registration and vital statistics systems: a case study of Thailand. Bangkok: Thai Health Information Standards Development Center; 2013 (https://www.getinthepicture.org/sites/default/files/resources/Final%20Comprehensive%20Assessment%20Thailand.pdf, accessed 9 January 2019). The National Health Security Annual Report 2017 [in Thai]. Bangkok: National Health Security Office; 2017 (https://www.nhso.go.th/frontend/page-about_result.aspx, accessed 9 January 2019). The 2017 Survey on Health and Welfare [in Thai]. Bangkok: National Statistical Office; 2017 (https://goo.gl/JuYkb7, accessed 9 January 2019). The 2015 Survey on Health and Welfare [in Thai]. Bangkok: National Statistical Office; 2016. (http://web.nso.go.th/en/survey/hw/data/2015_Full Report.pdf, accessed 9 January 2019). Wanwong Y, Viriyathorn S, Lapthikultham S, Panichkriangkrai W, Tisayaticom K, Patcharanarumol W. Unmet health need: outpatient, inpatient, and dental services in Thai population by 2015 [in Thai]. J Health Syst Res. 2017;11(2):182–94 (https://goo.gl/wuhSGL, accessed 9 January 2019). Knowledge about antibiotics and awareness of antimicrobial resistance: the 2017 national Health and Welfare Survey in Thailand. Bangkok: IHPP Thailand; 2018 (http://www.ihppthaigov.net/wpdm-package/antibiotics/, accessed 9 January 2019). Thailand MICS. Monitoring the situation of children and women. Multiple Indicator Cluster Survey 2015–2016. Bangkok: National Statistical Office and United Nations Children’s Fund; 2016 (http://www.nso.go.th/sites/2014en/Survey/social/domographic/MICS/Thailand_MICS_Full_Report_EN.pdf, accessed 9 January 2019). Thailand, Lao PDR, and Regional Malaria Operational Plan FY 2018. Washington (DC): US President’s Malaria Initiative; 2018 (https://goo.gl/EdX4Dj, accessed 9 January 2019). National Malaria Elimination Strategy, Thailand 2017–2026. Operational Plan, Thailand 2017–2021 [in Thai]. Nonthaburi: Department of Disease Control; 2017 (https://bit.ly/2zLUFVR , accessed 9 January 2019). Aekplakorn W. The 5th National Health Examination Survey [in Thai]. Nonthaburi: Aksorn Graphic and Design Publisher; 2016. (http://kb.hsri.or.th/dspace/handle/11228/4626, accessed 9 January 2019). Executive summary. The Cigarette Smoking and Drinking Behaviour Survey 2017 [in Thai]. Bangkok: National Statistical Office; 2017 (https://goo.gl/iDLkcy, accessed 9 January 2019). The 2017 Annual Report on Public Health Resources [in Thai]. Nonthaburi: Strategy and Planning Division, Ministry of Public Health; 2017 (http://bps.moph.go.th/new_bps/sites/default/files/report-gis60_10Jan2019.pdf, accessed 25 February 2019). The Government Gazette. National List of Essential Medicines, BE 2561 (AD 2018) [in Thai]. Bangkok: The National Drug System Committee; 2018 (http://www.fda.moph.go.th/sites/drug/Shared Documents/New/nlem2561.PDF, accessed 25 February 2018). World Health Organization. Joint external evaluation of IHR core capacities of the Kingdom of Thailand. Mission report: June 26–30, 2017. Geneva: World Health Organization; 2017 (WHO/WHE/CPI/REP/2017.38; http://www.who.int/iris/handle/10665/259365, accessed 9 January 2019). Division of Vaccine Preventable Diseases. Survey of essential vaccine coverage and vaccine coverage in primary school students 2008 [in Thai]. Nonthaburi: Department of Disease Control, Ministry of Public Health; 2009 (https://www.hiso.or.th/health_survey/DOC/vac_EPI_2551.pdf, accessed 25 February 2019). Patcharanarumol W, Witthayapipopsakul W, Saengruang N, Viriyathorn S, Wanwong Y, Rajatanavin N et al. Research Report on Effective Coverage Phase I Fiscal Year 2018 [in Thai]. Nonthaburi; International Health Policy Program; 2018. (http://ihppthaigov.net/DB/publication/publication_research_show.php?id=425, accessed 25 February 2019). Department of Disease Control, Ministry of Public Health. Annual report of Bureau of AIDS, TB, and STIs 2017 [in Thai]. Nonthaburi; Bureau of AIDS, TB and STIs; 2017. Thammatacharee N, Tisayaticom K, Suphanchaimat R, Limwattananon S, Putthasri W, Netsaengtip R et al. Prevalence and profiles of unmet healthcare need in Thailand. BMC Public Health. 2012;12:923. doi:10.1186/1471-2458-12-923. Suchonwanich N, Wananukul W. Improving access to antidotes and antivenoms, Thailand. Bull World Health Organ. 2018;96(12):853–7. doi:10.2471/BLT.18.217075. The 2014 Socioeconomic Survey [in Thai]. Bangkok: National Statistical Office; 2014 (http://service.nso.go.th/nso/nsopublish/themes/files/SocioPocket57.pdf, accessed 9 January 2019). Executive summary. The 2016 Socioeconomic Survey [in Thai]. Bangkok: National Statistical Office; 2016 (http://service.nso.go.th/nso/nsopublish/themes/files/Sociosum59.pdf, accessed 9 January 2019). National Statistical Office. The 2017 Household Socio-Economic Survey Whole Kingdom. Bangkok: National Statistical Office; 2018 (https://goo.gl/9yUrrZ, accessed 9 January 2019). The 2016 Report on Situation Analysis of Poverty and Economic Inequality [in Thai]. Bangkok: National Economic and Social Development Board; 2017 (https://goo.gl/1hVDnb, accessed 9 January 2019). Limwattananon S, Tangcharoensathien V, Prakongsai P. Catastrophic and poverty impacts of health payments: results from national household surveys in Thailand. Bull World Health Organ. 2007;85(8):600–6. doi:10.2471/BLT.06.033720. Limwattananon S, Tangcharoensathien V, Tisayaticom K, Boonyapaisarncharoen T, Prakongsai P. Why has the Universal Coverage Scheme in Thailand achieved a pro-poor public subsidy for health care? BMC Public Health. 2012;12(Suppl. 1):S6. doi:10.1186/1471-2458-12-S1-S6. Wiseman V, Asante A, Price J, Hayen A, Irava W, Martins J et al. Ten best resources for conducting financing and benefit incidence analysis in resource-poor settings. Health Policy Plan. 2015;30(8):1053–8. doi:10.1093/heapol/czu108. Cameron A, Ewen M, Ross-Degnan D, Ball D, Laing R. Medicine prices, availability, and affordability in 36 developing and middle-income countries: a secondary analysis. Lancet. 2009;373(9659):240–9. doi:10.1016/S0140-6736(08)61762-6. Wirtz VJ, Moucheraud C. Beyond availability and affordability: how access to medicines affects non-communicable disease outcomes. Lancet Public Health. 2017;2(9):e390–e391. doi:10.1016/S2468-2667(17)30168-8. United Nations. SDG Indicators. Metadata repository (https://unstats.un.org/sdgs/metadata/, accessed 9 January 2019).